Trifu Dojo is a premium martial arts school in Sydney, and we prides ourselves on providing you with a unique environment to learn a range of martial arts, and to join a welcoming community. Our Dojo is here to serve you, and to be a destination where you can hone your skills and reach your goals, in a supportive and respectful environment. We learn from our students too – why they are drawn to us, how we have helped them, and why they stay to become friends – they are the lifeblood of our community. In martial arts, there is no substitute for learning from masters. We were honoured that the man who founded global Kyokushin Karate movement sent his star pupil, Shihan Tokujun Ishi to Australia to grow the discipline – and our students benefit directly from this. In 1993, Sensei Daniel Trifu, founder of Trifu Dojo, began to learn from Shihan Ishi, and honed his skills over the next seven years. Sensei Trifu has over 25 years experience in studying and teaching martial arts in Sydney. He has competed in Kyokushin Karate and won at National, Asia Pacific, Oceana and International Tournaments. This is an incomparable heritage – and is just one of the reasons why many students humble us by choosing to train with at Trifu Dojo. Martial arts are ancient skills, but we understand that we live and work in an often time-poor modern world. With this in mind, we offer classes at an incomparable range of times and locations. Weekend classes are enjoyed by all, including family groups. Our ten locations across Sydney offer 84 classes every week. You have a wealth of choices, and we have tailored our timetable to bring the joy of learning martial arts to as many people as we can. Whether your interest lies in Kyokushin Karate, Brazilian Jiu Jitsu, Mix Martial Arts (MMA) or self-defence, at Trifu Dojo we offer you instruction in the discipline you choose. Our students love the way we structure our classes, which have been designed to incorporate a unique mix of challenge, fun and excitement. We also offer a range of classes for all ages, from young children whose parents want them to learn the value of respect, patience, goals achievement, through to adults who want to pursue their fitness goals or test their minds and bodies in an entirely new way. The cornerstone of any successful pursuit of a goal is focus, which for many is an acquired skill. By studying martial arts, you will learn to focus, and apply it to every facet of your life. At Trifu Dojo our instructors’ focus is on the individual student, whether you are a beginner child or experienced adult, and we teach you with respect, in a way that is ideal for you. You are never regarded as just another class member, or just a number. Many leisure and sports pursuits do not allow for shared enjoyment as a family unit – with age, size, and skills, being limiting factors. But here at Trifu Dojo we offer you classes that allow you to train with the young people in your lives. Importantly, young people can learn skills that are passive defences against bullying. These classes are immensely popular, and create a unique bonding opportunity in a supportive yet challenging environment. Martial arts are method of training your mind, body and spirit to act as one. Adults from different walks of life have enjoyed the immense benefits gained through martial arts training. Whether you’re after personal protection, health and fitness, building self-esteem and strengthening your self-confidence, our instructors will help and guide you to bring to light the amazing benefits of our adult classes. Every student is different and learns at their own pace, however if you want to gain the edge or improve your fitness, kata, basics, fighting skills, strength, defense. You name it. Everyone can benefit from a little personalized one-on-one training. Ask about our Private Tuition. It is beneficial for all students regardless of level or expertise. Not sure? We’ve Got That Covered Too! It can be daunting to commit to an entirely new pursuit such as learning martial arts – we get this. But we’re so confident about the learning environment we’ve created at Trifu Dojo’s 10 locations, that we offer a free two-week trial – we know we’ll see you back. And don’t be worried that there will be extra charges because when you do join, we supply you with your uniform – our ‘thank you’ for beginning your martial arts journey with us. 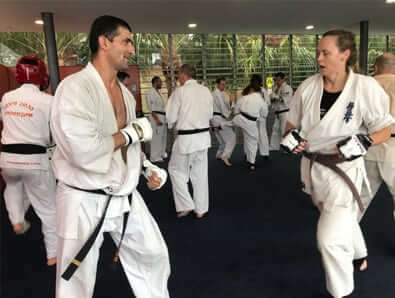 At Trifu Dojo, we know that we offer the very best martial arts experience in Sydney, and welcome your call Daniel on 0410 799 816 or Lynne on 0418 452 262, or complete the Enquiry Form on the right to answer your questions or to arrange your own two-week free trial. “We enrolled our identical twin sons, aged just 4, in “Little Dragons” at Trifu Dojo. The positives from karate include fitness, co-ordination, respect, self-control and a sense of achievement. The look when one of my boys won “Student of the Week” was priceless. The other one is taking his tournament trophy to school this week to discuss the importance of “giving it a try”.